Cutting aluminum with plasma cutter has had a lot of myth around it that has scared many people from making use of the plasma cutter. Some of these myths were true at some point, but with more innovations of the plasma cutter, they are losing touch of their grip. In this discussion, we shall be looking at some of these myths and shall be clearing the air on some of the misconceptions that surround them. We shall also be looking at some plasma cutting techniques to make the best cuts with plasma cutters. You sure might have heard one myth or the other about plasma cutter and have been wondering where r it is true or not. These myths among others include that aluminum can’t withstand flame, it barely meets the tight tolerances of the plasma cutter and that it is costlier than laser cutting. Are these cutting aluminum with plasma cutter myths true or false? We can only know by bursting these aluminum myths. There has been this long-held belief that aluminum cannot withstand the flame of the plasma cutter. In supporting this myth, a number of examples like the porosity on the cut edge have been cited. As true as this seems, it is a myth that has failed in more recent trials. Not only have we witnessed a number of aluminum cuts being made with a plasma cutter, but this has also been debunked. It all boils down to gas selection. Once you are able to select the right gas for the plasma cutter, you can be able to make really nice edges with them on aluminum. Another myth as regards cutting aluminum with a plasma cutter is that the technology in the aluminum plate barely meets the tight tolerances. While it is true that the plasma cutter has tight tolerance requirements to be met, it is not true that the aluminum plate doesn’t need it. This probably is a myth that would have thrived more with more ancient plasma cutting systems with higher tight tolerance requirements. However, in more recent plasma cutting systems that have been developed, this myth doesn’t hold water any longer. The technology of aluminum plate can be optimized in a way that it meets the requirements of the plasma cutter. There is also this myth that the plate leaves a tough mess on the surface that is many times impossible to clean. The mess left is based on how well the plasma cutter is set up. If the plasma cutter is properly set up, no mess will be accumulated. The gas selection also determines the surface condition of the plate making it possible to achieve a clean surface if the right gas is selected. 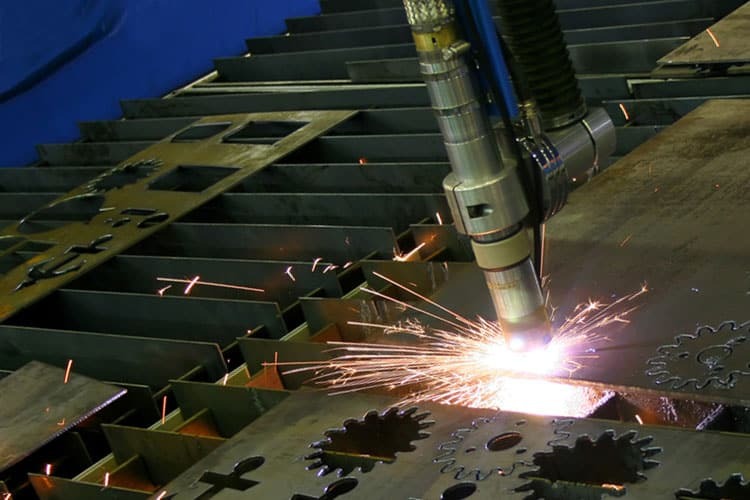 The cost of plasma cutting on aluminum being more expensive than making use of laser cutting has also been a long misconception. No doubt plasma cuttings are costly, but to say they are costlier than laser cutting is wrong to some extent. Lasers which are used for laser cutting, get their speed from a reaction which is known as an exothermic reaction. This reaction requires a lot of money and the laser cutting cannot be effected without them. No doubt laser cuttings generally require a lot of investment that is needed for plasma cutting. There is also a misconception that cutting aluminum with a plasma cutter requires a high level of skill and experience. This is not so true because instead of saying a high level of skill and experience, while not say a high level of care and attention to details. Anyone who is willing to learn and understand the functions of a plasma cutter can be able to make cuts on aluminum with them. Also if you a metal worker who uses the plasma cutter for other metal cuts, you can also make use of them for aluminum cuts. The only task here is that unlike other metals, you will need to exercise a lot of patience and pay attention to every step through the process. In other to make use of the plasma cutter to cut aluminum, there are some plasma cutting techniques that have been established. These techniques provide you with all the information that will help you know how to make clean cuts with a plasma cutter. Though numerous, we have selected the basic plasma cutting techniques and we shall be running through them briefly. Any tool is it woodworking or metal working that makes use of a blade to effect a cut needs extra care when using them. This is why, a number of safety measures are always required for the right uses of a plasma cutter. To use the plasma cutter on aluminum, you have to stick to the following guidelines. Safety many times especially when it has to do with working tools is best secured with knowledge. Make sure you have an understanding of how cutting with plasma cutters work first before you start using them for aluminum. Wear all the safety materials needed to protect your body like the face masks, eye goggles, and gloves at all time while cutting the aluminum. The use of materials that also protect your ears is also very important. This is because the noise from trying to make a cut on the aluminum can be very dangerous to your ears. Make sure all the parts of the plasma cutter are well secured in their place especially the blade. Fasten the screw of the blade to ensure that it doesn’t pull off when making the aluminum cuts. The blade pulling off is not just harmful to you, it can also damage the aluminum and the plasma cutter itself. It is important for you to know that if aluminum is left to go warm for a really long while, it becomes sticky. So in order to prevent this, it is very important that you establish a solid connection between the plasma cutter and the air source. This allows for cross ventilation that keeps the aluminum at an average temperature. After a meaningful connection must have been established between the plasma cutter and the air source keeping the aluminum cool, you can go on to turn the plasma cutter on. When you put on the plasma cutter, you will need to exercise some patience for it to respond. This might take a while, but it is necessary so as for it to generate all the heat energy needed to cut through the aluminum. Once the machine responds, you will need to position it properly first for the type of cuts you want to effect than for the size of the aluminum. Good positioning of the plasma cutter is very necessary to make accurate cuts on the aluminum. The plasma cutter to be used should depend on how thick or otherwise the aluminum sheet is. Aluminum with thicker sheets will need the service of a plasma cutter that has a wide gap and big arcs that will be needed by aluminum sheets that are not so thick. The speed to be used is very important as much as the amperage is. So you have to set the speed of the plasma cutter based on the cut and the thickness of the aluminum sheet. To do this, you will need to move the torch very fast and the arc very slow so as to prevent it from going into the metal. Sticking through and following all the steps above, you are good to go to start using your plasma cutter to make the cuts. To start cutting aluminum with a plasma cutter, you will need to constantly move the torch in the direction you want it to go. Make sure to pay attention to the aluminum as the cut is being effected for accuracy. When making use of the plasma, make sure you are dragging it on the aluminum, instead, it is best to move it as required. This way, you can prevent any damage to the plasma cutter or save yourself from many of its dangers. The best way to get the job done and properly done when cutting aluminum with plasma cutters is to have the pattern sketched out and prepared first. This way, you will just follow through the sketch as you replicate same on the aluminum sheet. Having a plan in place for a large aluminum chunk makes cutting faster and better. Cutting aluminum with a plasma cutter can be as easy as it is with other metal. Following all the steps provided not only gives you an on how to cut with a plasma cutter, it can also make you a professional at it. It is however suggested that you understand the safety requirements first before you go on making cuts on aluminum.